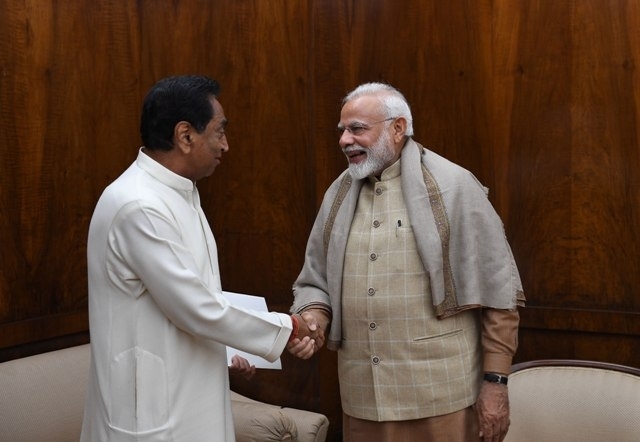 Bhopal: The Chief Minister Kamal Nath today met the Prime Minister Narendra Modi at New Delhi and had detailed discussions on issues relating to agriculture and mining to expedite economic activities in the state. Nath requested early action on 27 cases which are eligible for a grant of mining lease to speed up the state's economic activities. Kamal Nath apprised the Prime Minister of pendency of 170 such applications eligible for mining lease under Sections 10-A and 2-B of the Mines and Minerals (Development and Regulation) Act. Prompt decision on these proposals will spur the state's economic activities. Kamal Nath also urged the Prime Minister to help release Rs 575.90 crore as the cost of implementing prize deficient payment scheme for the oilseeds. He expressed commitment to implementing Prime Minister's Annadata Aay Sanrakshan Abhiyan. Nath apprised Modi of the prevailing scenario that Madhya Pradesh paid Rs. 1951.80 crore to the farmers as difference in the minimum support price and the model selling price. He said that if this crop had been procured by the Nafed at minimum support price, then administrative costs and losses would be around 2800 crore. Nath requested the Prime Minister to allow Madhya Pradesh increase the target for Soybean to 40% i.e. 26.92 lakh metric tonnes in the price deficit payment scheme.